Termites | Infonet Biovision Home. Different species of termites damage cassava stems and roots. Termites damage cassava planted late or in the dry season, in particular when the crop is still young at the peak of the dry season. They chew and eat stem cuttings which grow poorly, die and rot. The may destroy whole plantations. 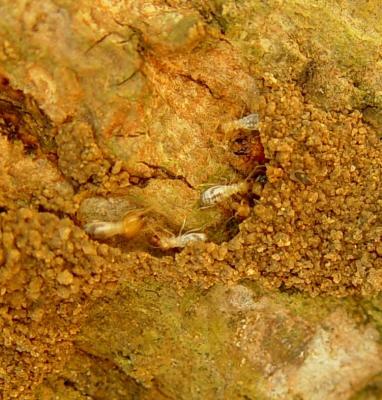 In older cassava plants termites chew and enter the stems. This weakens the stems and causes them to break easily. Avoid planting on very dry land or on termite mounds. Plant early with the rains. Local names; white ants, mchwa (Swahili); Harvester termite ([i]Hodotermes mossambicus[/i]); Bark-eating termites ([i]Macrotermes[/i] spp., [i]Odontotermes[/i] spp. ).